The Andy Warhol Batch Conversion tool allows you to batch process your photos. You can batch add Andy Warhol (Pop Art) effects, resize, rotate and rename a great number of your photos in ease. All of the process can be done in batches. 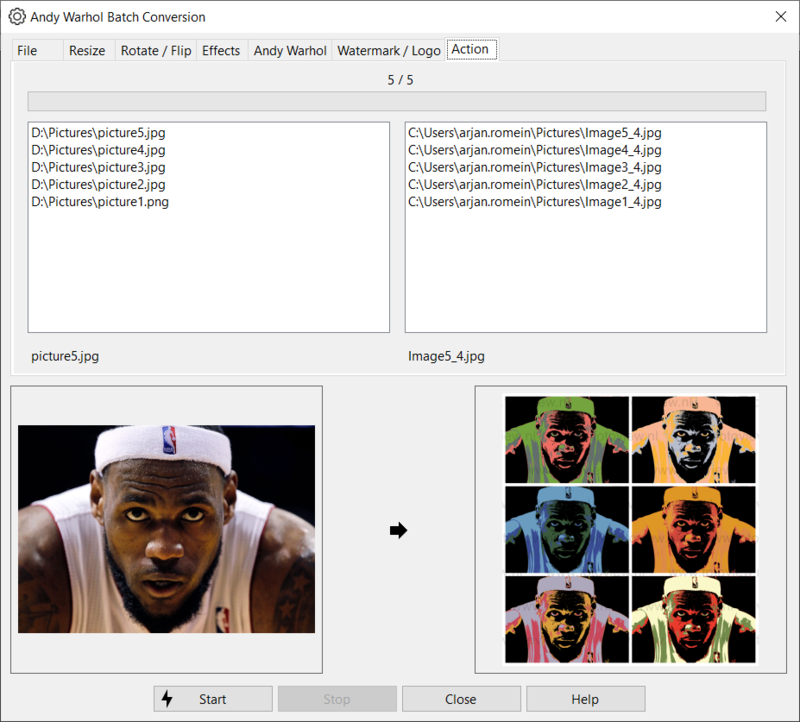 The Andy Warhol Batch Conversion tool helps you to convert hundreds of digital pictures with a few mouseclicks. This option allows you to specify the source location and the destination location. This option allows you to specify the source location. This option allows you to make a custom selection from the list. For multiple selections hold down the control key on your keyboard while you select with your cursor. This option allows you to specify the destination location. This option allows you to use structured file names for your destination files. In the text field you can type in a file name. The program will automatically add a sequence number to each file. Use this option to specify the destination file format and file format options. This option allows you to automatically print the converted images without any intervention. You don't need to print them manually. Use the drop-down list to select the printer to which you want to print the files. The command allows you to enlarge or reduce the physical size of the image by changing the number of pixels it contains. It changes the size of the contents of the image and resizes the canvas accordingly. The command allows you to rotate the image 90º. The command allows you to rotate the image 180º. The command allows you to rotate the image 270º. The command allows you to rotate the image by angle. The command allows you to flip the image horizontally. The command allows you to flip the image vertically. Use this option to add Andy Warhol style effects to your images. Use this option to start and stop the processing, and shows its progress.